The Rool'oang platform, looking inland. "Rool’ong is a place for the entire Outer Islands, beginning from Yap all the way up there," Stanley begins. 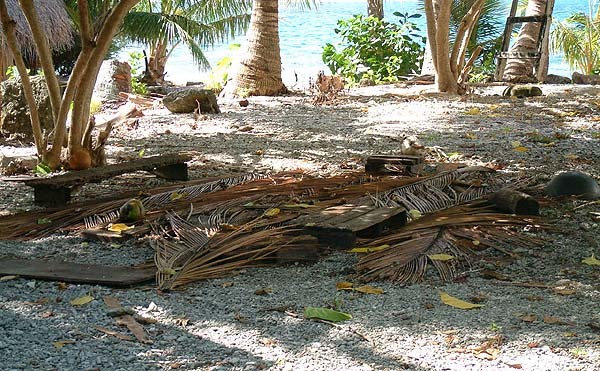 "On every island that holds the chain of command, Wottogoi and Lamotrek and Puluwat, there is a taboo platform connected to this. All those islands have this. But not any other islands in Ulithi. And we mtaang are responsible to look after that place. 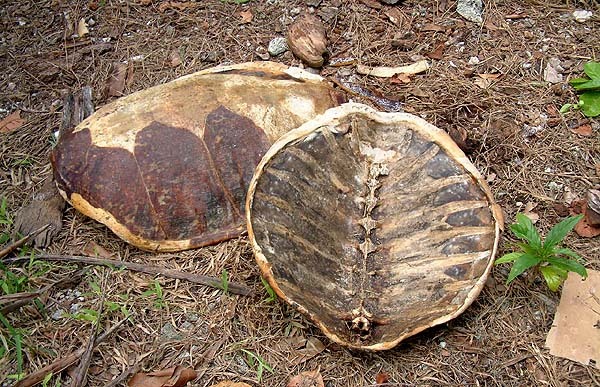 "Now Rool’ong is preserved only for the distribution of fish, and turtle, and other foods. But in the past, Rool'oang usually had a structure like a Men’s House, but for some reason that structure came down and we don’t put that up any more." "You don’t walk around on it, because that’s a place for food. It’s taboo, you don’t just wander across. No. So we make sure when we have newcomers here, when they come to the Men’s House to report their purpose of entering Mogmog, we make sure they know that that’s the taboo platform, a place we don’t walk across." Men's-House side of the Rool'oang platform, looking towards the sea. 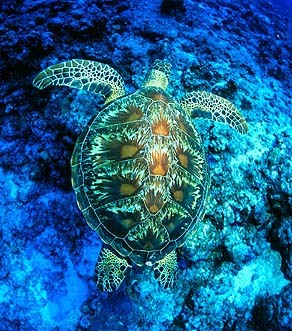 Green turtle. Photograph by Ethan Daniels, used with permission. "Turtle should be taken to Rool’ong and divided accordingly. We don’t have turtles. But we’re connected to the turtles through an event in the past. A brave son of the chief of L'oosiyep came and stole the daughter of the King here. "On L'oosiyep, turtle’s their main meat. And when this woman got pregnant, the husband bestowed the turtles to her family on Mogmog, so his wife could have good meat to help her in breast-feeding the baby. And then it’s continued on until now. So, that’s the reason why that the turtles are given to Mogmog." (This story is told in more detail in the Footprints chapter). 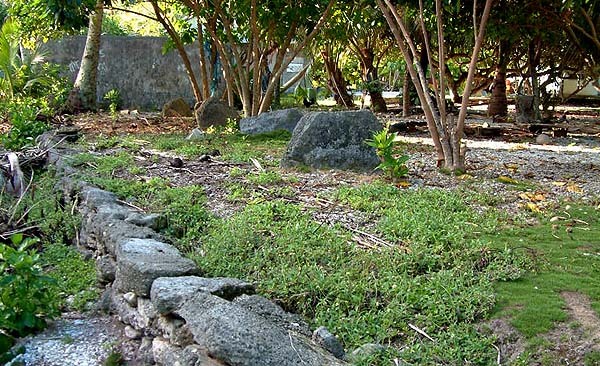 "When turtles are caught in Ulithi," Juanito adds, "they have to send a canoe here to come and report. ‘There is turtle here.’ You know there’s a turtle coming from, say, Fedraey because of the position of their canoe. And if they caught, say, ten, they will come and report nine. They say ‘we have nine turtles and we’ll bring them tomorrow.’ First they report and they go and bring them." "The reason they report only nine is in case one dies during the night, then they bring nine. So they report nine. And if nothing happens, they bring the ten, and they say ‘oh, we caught this one on the way’." "The intestines are taken out first," Stanley says, explaining how turtles are divided. "To get the intestines, we open the throat of the turtle and pull them out. This is done only the L'amwdah people, the men from that platform; it’s out of our hands, so somebody from that family will come and do it, because the intestines are separate from the public food. "And the chief is waiting up at his platform. And my mtaang is responsible of preparing the wuumw, the earth oven: our women are the ones that are doing that, because men are over there, dividing the turtle meat." 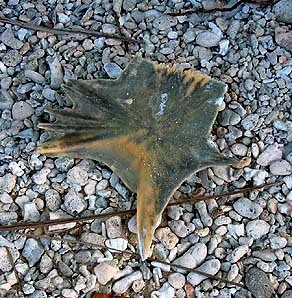 A turtle breast bone on the ground near the Rool'oang platform. 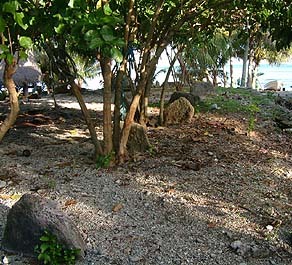 The distribution of turtle on the island of Satawal. Photograph by Benigno Sablan. "In this wuumw we will cook the intestines in small woven baskets, we call them baach. Then after you have collected enough for the chief, and then you put in the earth oven, you cover it up, you wait, when it’s cooked, so before people eat the turtle, the chief will have already had some, before everybody else, and when he’s had enough, maybe he sets aside some for himself for later, then he distributes the remaining small baskets to the mtaang here and to Faesiiulius. That’s the traditional practice and we’re still doing it now. "Now when we have plenty of turtles and we have intestines taken up there, the L'amwdah people will divide the turtle intestines so we have equal parts. They have their share, we mtaang have ours, and Faesiiulius has theirs. And the heads, they go to Faesiiulius, and what they do, they also divide in the same way they do with the intestines that belong to the chief. They divide how many heads, ‘O.K., they put some for them, give us some, give some to L'amwdah’." “We collect the meat from the heads. But in the old days we didn’t eat the head. It went as a gift or an offering to a spirit, and we learned to take the head and put it over there at the platform called Faesiiulius. They don’t throw it away, it just hangs over there until it’s all smelly, and then just the bones remain. And it stinks. There used to be a big pile of skulls over there." Faesiiulius, the platform that traditionally receives the heads of the turtles. 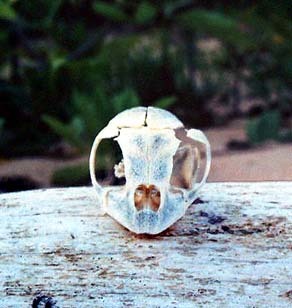 Green turtle skull. Photograph by Benigno Sablan. “Today we don’t practice that spirit anymore. Probably the spirit ran away, but the head’s are still going there. When the priest Father Walter came, he said, ‘I understand your custom, your culture and tradition, and that’s better because you honor something that you survived with from long time ago until now. But now instead of taking the heads over there and just leaving them until they get spoiled, why don’t you eat them?' That makes sense, because we don’t have much food here, on a small island. “Now, once the intestines are removed for the chief, that’s when the mtaang are entitled to come and divide the rest. First we set a fire on the turtle. After that, we tow the turtle up to the Rool’ong and that’s where we mtaang come and divide it. We open the chest, then take the chest plate outside of Rool’ong so the kids to play with it, and then we do the distribution." "First we take the left breast meat, which is set aside for Filtey and taken to the Women’s House. And then we just cut the rest to take out from the whole turtle shell. And then the mtaang do the cutting: we open the turtle, we take out everything and then we chop, people have to chop, and then when all the turtle is in small pieces, that’s when we have to do the dividing. "But Falalop people, if they brought the turtle, then after we open and get what we’re supposed to take, we give them what they should take, then they go back home." “Not everybody in the lagoon gets some of this turtle. Just people here on Mogmog, but if they want, they have to come over, and stay here during the butchering. Then as newcomers, they will have share, no problem with that. Once a canoe or a boat from Asor or from Fedraey arrives, it is certain that they will have some meat out of that turtle that we have in Rool’ong." 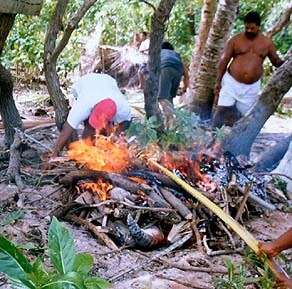 Satawal islanders building a fire atop a turtle. Photograph by Benigno Sablan. 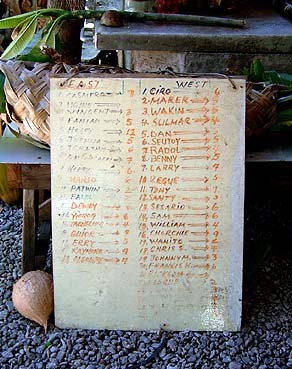 Stanley's chart identifying families from the East and West sides of Mogmog. "So we go until it’s all equally divided. Then we go to the liver, then we go to the lungs, just like that. So everybody gets every different meat. Except the intestines—that’s already up here, where the chief sits." Empty shells are are that remain of these two turtles. "There are other things that are divided on the Rool'oang: whale, dolphin and the first annual catch, and this blue marlin and sail—all types of fish with the sword. The first catch of the year, and other types of fish that have to be divided over there by mtaang, we have the same way of cutting them up and dividing them accordingly. It’s the same pattern, except with whale, turtle, and dolphin." "If it’s a whale, it’s going to be big meat! We have to tie, and then maybe we put a pole through the rope so each man will be on each end and pull it while somebody is cutting the meat off the bone. It’s hard work and we just divide it up, cut all the meat down and all that, and then we do the dividing to the islands. "For whale, the islands are ranked into two groups: Daworl’ap and Daworchig. Some islands belong to Daworl’ap, and some islands belong to the Daworchig. That’s their rank. When we say Daworl’ap, whatever island is in that category of Daworl’ap, they have the same rank of responsibilities that they should do for the chief of Mogmog. And Daworchig, same thing. This applies only to dividing whales." 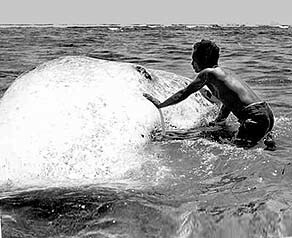 Yapese man with a whale. 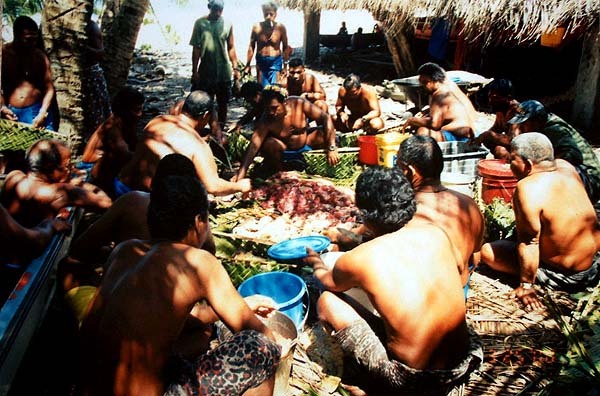 Photograph from the Trust Territory of the Pacific (TTPI) Archives. 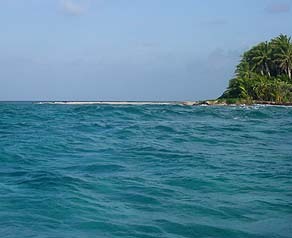 The sandbar next to Asor, onto which whales and dolphins may be herded. "People did not actually spear whales here," Chief Taithau points out, "but they could sort of herd them toward the sand bar where they wash up—they just get up on the sandbar. People would surround the school and then move them toward the sandbar by Asor." "This is the traditional practice our people have handled this: they just look at the fish and if they think the fish is proper size, it can be divided among the mtaang and the hafaarag. If the chief says ‘O.K., it’s become a maaem, you take it to Rool’ong." 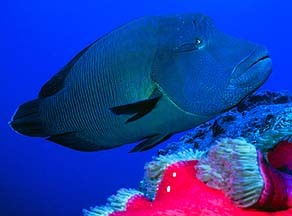 maaem—the Napoleon Wrasse. Photograph by Ethan Daniels, used with permission. The central area of the Rool'oang platform, where the division takes place. “And if it’s smaller, you should still take it over there. But if it’s too small, you don’t call it a maaem because it cannot be divided and distributed, it’s too small. You don't just say, ‘that’s a small maaem.' No, don’t mention maaem; once you mention maaem, then even a small one, it goes to Rool’ong. It’s that name. “So you can name it something else, even it’s not that type of fish. They say, ‘Oh this one is a…’ then you say the name of another kind of fish. ‘Oh, okay, then we understand.’ Then you can take that home. This is true of wahoo and those other ones—except dolphin, marlins and whale: how can you say it’s not a whale?" "Only Chief Taithau can come and say, ‘oh, that’s something else.’ No other, not me—I’m the second, but not me. Unless for some reason Chief Taithau may pass on to me, ‘please I can not walk, because I am unwell, you go and you pronounce it, it’s this type of fish.' Then that person will take that fish, and if he is related to us he may spare a piece of it to us. And to the poor, especially. 'You go and say this type of fish'—that’s when I can do it, but it’s a little scary." "The first annual catch of the wahoo, yellowfin—it can be marlins, dogtooth—we call it igerroet. When we chop it up, the meat on the upper right side is for mtaang, with the bone; and the lower meat with the intestine, you set aside. So after you cut the upper meat with the bone for the mtaang, that’s the right side of the fish, and then the upper left side of the meat, you take it to Faaelgal'aw. Faaelgal'aw is not a ranking house, it’s only a place to gather food." The complicated affair of dividing fish on the Rool'oang: different portions from different sides fo the fish (a yellowfin, here) go to different platforms on the East and West sides of Mogmog. Based on a drawing by Serphin. Whales are divided in a different fashion. From a drawing by Serphin. "And the rest of the bottom part of the meat, both sides, you chop it up for the hafaarag. And the head, we’ll take it over to Faesiiulius. So the bigger part of the upper part of the meat—the section towards the head—it goes to Chief Taithau’s platform. That’s first mtaang, Faaelmey. “We mtaang are the ones who distribute the fish collected for the entire village. We cut the fish in the taboo platform and we make sure that everybody has a share, and we make sure that the newcomers that spend time with us have a share. We call that waasool'a, those are the priority ones. If we have a distribution of fish, and if you’re a guest staying with me, that’s always the first share to set aside for you, for newcomers." "So we have to be responsible and to make sure that all these are handled properly, and when the dividing and distribution are finished, you shouldn’t hear any complaints, because everything is all taken care of properly." Roke Wur remembers a practice where people from Falalop used to paint a spirit house at the Rool'oang, using turmeric. Read his story here. While the distribution of certain fish and other sea creatures takes place on Rool'oang, another, bigger distribution of goods takes place at an even higher-ranking set of sites in Gachpar.